Total hip replacement (THR) involves replacing both the ball (head of the femur) and socket (acetabulum) of the hip joint with implants. These new components are designed to in­teract and function in the same manner as a “normal” hip joint. Which Dogs are Good Candidates for a Total Hip Replacement? A painful hip that is affecting your dog’s comfort and mo­bility is the primary indication for a THR. Rear limb stiffness and lameness, difficulties ris­ing from a sitting position and climbing stairs and reluctance to exercise are often the first signs that suggest your dog may have a hip problem that requires treatment. Total hip replacement can be performed in any dog large enough to accept the implant (usually > 8 lbs. ), and those who are near or at skeletal maturity (finished growing). In most dogs, 9 months of age is the earliest the THR procedure can be done. 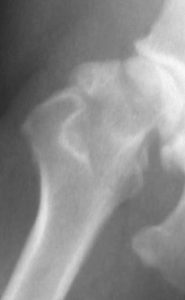 Radiograph (x-ray) showing arthritis in a dog that would benefit from Canine Total Hip Replacement. Is my Dog Too Old to Have a THR? There is no upper age limit for the procedure as long as your dog is otherwise in good overall health. Healthy older dogs have the same prognosis as young dogs, however we recommend that owners con­sider additional diagnostic tests for dogs older than 7 years of age prior to a THR. In addition to complete blood work (CBC and biochemistry profile), an abdominal ultra­sound and thoracic radio­graphs are recommended. These important, but option­al, tests are intended to rule out “silent” but potentially significant diseases that may negatively impact outcomes following major surgery. What is Expected following Total Hip Replacement Surgery? Should I Stop Giving My Dog’s Medications Before Surgery? Medications for health conditions such as diabetes or low thyroid function should not be stopped. Medications for hip pain can be continued up until surgery. Oral steroids should ideally be stopped one week prior to the surgery. Is Surgery Performed the Day of My First Appointment? No. Your dog must be screened before surgery which involves taking a com­plete history and a perform­ing a physical/orthopedic ex­amination. If the preoperative evaluations reveal no other abnormalities, your dog’s sur­gery will then be scheduled for another day. Additional hip X-rays are typically taken at the time of your dog’s THR sur­gery in order to measure them for their implants. The routine length of hospital­ization following THR surgery is overnight. What is the Success Rate of Total Hip Replacement Surgery in Dogs? Over 90% of dogs experience dramatic improvements in their overall function after THR. While the prognosis is typically excellent following THR, peak recovery (progres­sive resolution of lameness, muscle development, etc.) is generally not achieved until 4-6 months postoperatively. My Dog has 2 Bad Hips. What’s the Chance the Other Side Will Also Require a THR? Only 20% of dogs that have bilateral hips disease require both hips to be replaced in their lifetime. If indicated for the unoperated hip, multi­modal medical management of osteoarthritis can be con­sidered. What are the Potential Complications Associated With THR? While the occurrence of THR complications are the excep­tion, they will be thoroughly reviewed during the consul­tation. At MedVet, we have board-certified anesthesiolo­gists who oversee anesthesia in all patients undergoing surgery which helps to ensure it is as safe and comfortable as possible for your pet. What is the Postoperative Care for my Dog after Total Hip Replacement? Your dog should only be let out on a leash to urinate or defecate. Your pet should avoid stairs or slippery floors. Your dog should not run, jump or play for the first two months after surgery. When your dog is not under your direct control, they should be kept confined to a small area, cage or crate. Limited leash-based activi­ties are allowed to encourage immediate limb use following THR. All written postoperative care will be discussed and demonstrated for you at the time of your dog’s discharge from MedVet.